Ok, 1 project, 2 years and 2 different general contractors. We obviously didn’t get it right the first time and the second attempt was a failure as well, so while I can’t give you a fool-proof method or checklist on how to go about finding and hiring a great, ethical, morally fit and competent general contractor; I can share with you what worked and what didn’t. Basically lessons from the University of Life. Sure, we read and followed all (most) of the great and insightful advice given on numerous websites (most probably written by someone who has never been through this process) but we still got scammed. Two professional and business savvy people victimized by contractors who seemed to be not only one step ahead of most of the advice but most importantly the system, the system specifically put in place to protect homeowners. Have an Attorney Review the Contract. It’s a no-brainer that you should always have a written contract between the two parties. It doesn’t matter the size or scope of the project there should always be a contract specifying at least the commencement date, estimated completion time, total cost of the project, payment method and plan, insurance coverage, detailed specifications of the project as well as what constitutes a default (BOTH parties) and the possible remedies. Of course there needs to be additional language covering delays, change orders and termination language for both parties as well as various other sections addressing permits, inspections, utilities, etc…however what most don’t take into account or stop to realize is that the contract is usually supplied by the contractor. That’s right; it’s the contractor’s contract, written for the benefit and protection of the contractor. See why you should have an experienced attorney review it? And by experienced I mean someone who deals in construction law. Believe me, the few hundred dollars spent having the agreement modified to offer you the same mutual protection is well worth the alternative. Last, despite what you might be told, there is no standard contract and they all can be modified. If your contractor tells you he won’t accept changes or that it can’t be done then you need to find someone else. Insurance. 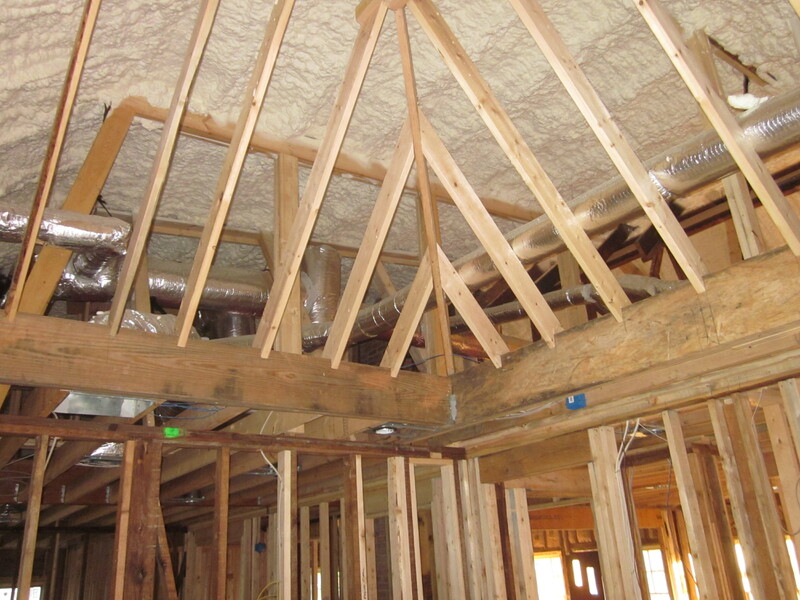 Require that the contractor provides you with all of the proper insurance coverage for your project. Make them supply you with proof and make a copy of it. Call their insurance carrier and verify the amount of coverage & type. Also keep track of the expiration date of the policy to make sure that it covers you throughout the construction period. Last, have your insurance carrier review the insurance language in the contract as well as the coverage carried by the contractor. You Control the Money. Meaning, if you’ve obtained a construction loan to finance your project, make sure that only you have access to receive and/or order a distribution. Believe it or not but giving the contractor the authority to withdrawal funds is a somewhat common practice or request – but you’re only asking for trouble if you agree to it. Thankfully we didn’t, and while both of the contractors weren’t entirely please with our resistance they eventually got over it. If your contractor requires such – RUN!! Lien Waivers. Make sure that you receive a lien waiver from the contractor each and every time you provide them with a payment. A lien waiver stating that they indemnify you and your property and that their business (& them personally if able to achieve) will take full responsibility if ever a claim of non-payment appears. Also, make sure that your attorney reviews this agreement prior to the final execution of the Construction Contract/Agreement. Better yet, try to obtain the ability to pay any subs directly and require that they indemnify you via a Lien Waiver; you can still pay your contractor his percentage fee separately. Only Pay for Completion. Pretty self-explanatory but only pay for completed work. When things started to get off-track with our second contractor we arbitrarily decided to only pay for work which was 100% complete and only on rare occasions would be pay for work which wasn’t, then paying a percentage which was less than the percentage of what was actually finished. Example, you receive an invoice for the labor of installing sheet rock throughout the house(100%) however only 90% of it has actually been hung, you would only pay 50% of the invoice, with the balance being paid once that particular job is 100% complete. I sure wish we had implemented this from the beginning, as once we did a number of unfinished items were quickly completed. Do Not Pay In Advance for Materials. Looking back the only way that I would agree to altering this stance would be for specialty ordered cabinets or something similar with a higher dollar value. 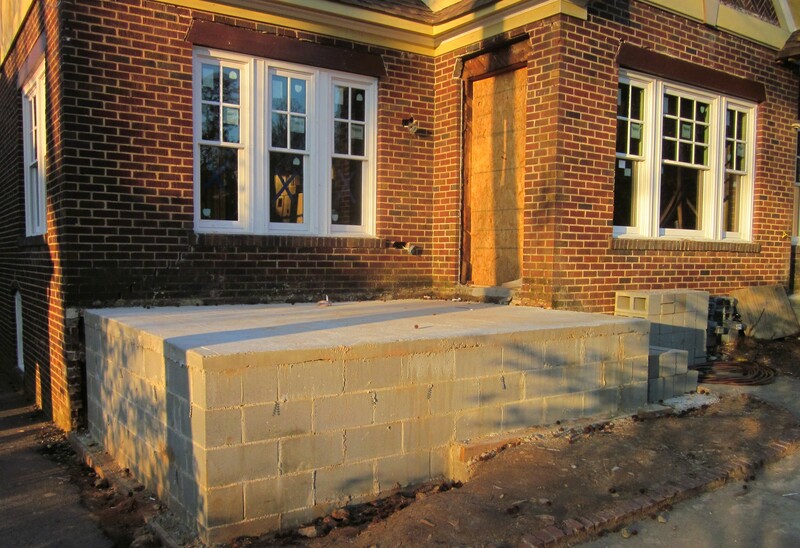 If your contractor is unable to afford to front the initial expense then his bank account is probably a little too lean. We got stuck on this one – our second donkey told us that it was required by the vendor for us to pay for half of the cost of our exterior doors upfront and the balance would be due on arrival. Stupidly we did, and once we released him and went to pick up the doors from the vendor we were quickly told that they never received our initial “down payment” and they’ve never even had such a policy. Trust is a two-way street. View Completed Projects, but More Importantly View Current Job Sites. Fairly self-explanatory but when viewing current jobs don’t just stop by during arranged times; go by unannounced at odd times so you can see the quality of the work as well as the condition of the job site. Don’t Just Check References. Of course ask for and actually call the references supplied to you but know that those are most likely cherry-picked, as I doubt anyone would provide less than stellar references. Go one step further, most municipalities allow you to view permit information online where you can search by address, owner’s name, contractor’s name, etc… Run a quick check for permits pulled by your contractor over the last few years and see if there are any names/jobs which weren’t given as references by the contractor and then reach out to them. At the same time some municipalities even go so far as to list online which inspections passed and which ones failed for each job – great info to have. Sure wish we had known about this in the beginning, our first contractor had a less than stellar inspection history. Get a Detailed Bid. It may seem like overkill and it’s a lot of work on the contractor, and potentially for you, but the more due diligence done on the front-end the less chance for surprises down the road. Don’t Fall in Love, Trust that Little Voice. It’s so easy to get swayed by the fast talk, fancy promises and flashy pictures and websites. Most contractors aren’t there to bring to life your dreams; they’re there to win the job, and some at any means necessary. Most of these guys could have a successful career as a politician so only trust less than half of what’s coming out of their mouth. Remember, they just want the job. If the promises or prices seem a little too good and aren’t in-line with those you’ve received then move on to the next guy. Nobody can pull a rabbit out of a hat without fooling you, don’t be that fool. Third Party. While some general contractors now offer in-house architectural services I would strongly advise that you hire an outside source. Why? Some in-house architects are great but you have to remember who they ultimately work for on a daily basis, even after your job is complete. Ask those in your neighborhood who they would recommend and then interview each of them until you find one that fits your project. I would also recommend finding one that is experienced with project management and who will be actively overseeing its progress. 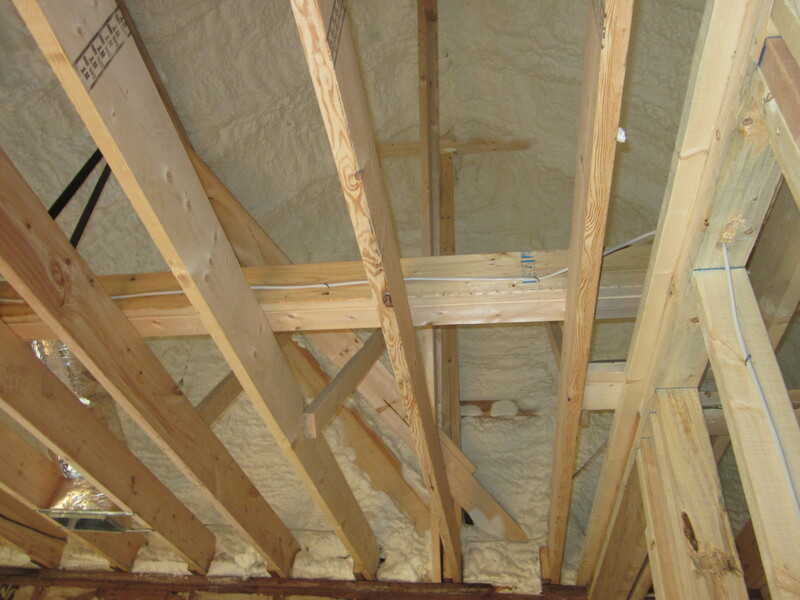 If you’re going to have a considerable amount of structural work performed then I would also highly recommend that you hire a structural engineer to overlook the architect’s plans as well as the work being performed. Most architects have a few which they work with regularly which is fine, just make sure that your contract allows for you to have the ability to hire these advocates and then follow through with doing so. Nobody likes having someone look over their shoulder, especially when they “know” how to do their job. But despite what you might be told, the extra money spent on hiring a third-party is well worth the investment and can not only save you money but can also save your project. While we used our contractor’s architect, big mistake, we did hire a structural engineer on our behalf and it was beyond worth it and ultimately ended up salvaging our dream/home. Careful with Fixed Priced Contracts. So the appeal of a fixed priced contract to homeowners, or at least to those which I’ve spoken with, is that you know the price will never be over the agreed to construction cost. Won’t be under and it won’t be over. The general mindset or fear of most is the possibility of the cost getting out of hand and potentially becoming unaffordable, the Fixed Priced concept is supposed to eliminate these fears; with the homeowner thinking that any cost over the contractually agreed to price will be the responsibility of the contractor. Think again, these guys aren’t idiots. Somewhere in the contractor there will be very liberal language discussing unforeseen conditions as well as change orders. One guess who pays for any extra expenses associated with these unforeseen conditions and change orders? Yep, you. And they’re quick to list something they should’ve taken into account on the front-end and label it as an unforeseen condition, sort of an extra layer of protection for them. Keep Everything Tidy. Make sure that there’s language in the contract requiring the contractor to maintain a clean and orderly work site with all trash and debris being swept up and deposit in a dumpster at the end of the day. Take Pictures. I’ve mentioned this before but take pictures throughout the process. Besides being able to look back on the progress being made these are also provide a great piece of evidence if ever needed in the future. Hold Some Back. Make sure that the payment plan is structured where you’re not required to pay the last 15-20% until after the job is 100% finished, punch-list items are completed and all Lien Waivers have been executed. You’ll definitely experience some resistance over this one but try to hold back the same percentage as what your GC is charging for his fee. Sober Up. It’s so easy to become intoxicated over the initial excitement, but try to step back and view this as a business decision. Take all emotions out of it and if you feel comfortable doing so, maybe use a trusted friend as a sounding board and then ask for their advice. Did we do this? Nope, we stayed “drunk” for the first several months and then finally sobered up before it was almost too late. This is by no means a comprehensive list but just a few of the items which immediately come to mind. Please feel free to add to it or share some of your past experiences. Tags: atlanta, Construction, DIY, general contractor, HGTV, hiring a contractor, Home improvement, morningside, remodeling, Renovation, tips | Permalink. I’m not a regular follower of American Idol however the winner from a few seasons back, Phillip Phillips, first introduced and sang his signature song “Home” which eventually achieved a # 1 ranking on many charts and as a result received a considerable amount of airtime (some would scream, “over-played”) on radio, TV & film – and also in my head. The lyrics of “Home” are fairly vague which let’s one derive their own meaning from it and has probably led to some of its popularity; however during the last several months of our renovation project the main line which states, “I’m going to make this place your home” is probably where my personal connection to this song actually began. Over time as I eventually paid attention to the rest of the lyrics I found them also somewhat relatable to our then current renovation journey. So it became my personal and unofficial theme song during the last half of our crazy, stressful, frustrating, disheartening and at times disappointing journey. While “Home” eventually found its way to my iPod I was never guilty of blaring it through my speakers or reaching for it when needing a little inspiration. Nothing like that at all, this was more intimate and personally developed over time. As mentioned earlier, several months back you almost couldn’t turn on your radio without hearing it. But it seemed as if every time I got in my car after experiencing or hearing about another disappointing setback (and they were numerous) or when we would question the logic behind continuing to move forward when one of us would want to throw in the towel, this song would be playing on the radio and it seemed to drown everything else out and refocus my original purpose of making sure J received her “forever home”. Now looking back it makes sense why over the last several months of our project I felt as if my brain had this song on some vicious repeat cycle. Unfortunately those verses became a reality as we eventually realized that who we once thought was our Superman(our new GC) was far from it. Now there were similarities, both of them heroically rush in to rescue someone in a dire situation, however that’s where it all pretty much ends. Unexplainable & lengthy delays, excessive expenses and mistruths became too frequent and numerous as weeks and eventually months passed with little to no progress being made. Eventually we realized that we weren’t alone and the reasons behind some of those delays were ultimately uncovered. Our agreed to payment process was fairly standard, the GC, or his subs, performed the work; weekly an invoice or draw was created & presented to us and we would either write a check for the full amount (if all was completed) or for an amount equal to the percentage of what was truly completed for that specific task. He would then reimburse his subs and/or vendors, deduct his agreed to fee and present us with a Lien Waiver. Pretty simple process and one which would keep everyone paid on a timely basis and hopefully minimize delays which was extremely important since we were already so far behind our original construction completion date and still carrying the financial burden of two houses. Except there was one little issue, although we were a little late realizing what was truly happening it was eventually brought to our attention by a few of the subs that over the last several weeks our new GC had started making it a habit of either short-paying them & the vendors or just not paying them at all. So there’s no mistake, I realize that there are some very good contractors with extremely high ethics but I’m also confident that there are numerous others which are either incompetent or as greedy and crooked as the two we’ve experienced. The problem is that the bad ones are just so damn good at strategizing how they can take advantage of a situation and milk the homeowner for every possible dollar while getting away with it. And to make it even worse they know how to work around or just barely within the laws which were originally designed to “protect” the homeowner and prevent this from happening. Now if you’ve read any of my earlier post it’s probably fairly obvious that 1) I’m not very bright and should have bailed on this whole project numerous times before, 2) a personal trait which I like to think of as persistence is probably better defined as bull-headed and 3) I wanted to give J her “forever home” and was determined not to let anything stand in the way of it. While our home is now complete it was a long, difficult and extremely stressful road. Threats, intimidation & frequent mistruths all became a common place with our GC. Threats of further delays, additional costs if we decided to terminate the relationship and the threat of placing liens on the house were all tossed around whenever we began to ask questions or push back against their answers. 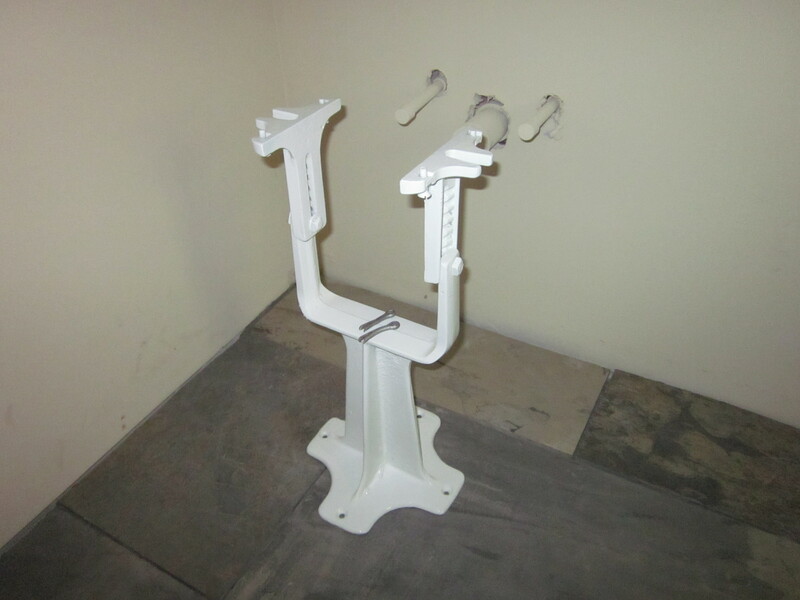 Any of these would have been enough for most people to terminate a relationship but we just felt at the time that despite all of this they were our best hope for completing our dream as we continued to try to convince ourselves that this was possibly just part of the home renovation business – the norm. To give credit where it is due I have to admit that they were good in some areas; their structural work was good and their subs were great; however they were even better at creating a situation where we felt as if we were being held hostage financially and ultimately for completion. But we weren’t, we had an angel – plus the two of us can be a pretty formidable team when we share the same goal. After cutting our loses and painfully walking away from our initial deposit we set out determined to GC our own project, our minds determined to finish the job. Couldn’t be much to complete, all we had left to do was; finish the floors, install the rest of the trim, hang all of the doors (interior & exterior), painting (interior & exterior), have all of the cabinets & countertops installed, completion & installation of all of the electrical and plumbing fixtures, construction of the built-ins as well as the hearth and mantle for the great room, rebuilding and finishing of the outdoor room & deck as well as the carport area, grading & pouring of the driveway, back-filling the area around the basement expansion, completion of the front porch, completing the exterior brick work, installation of the glass walls & doors for the shower in the master bath, replacement of the water & sewer lines as well as the coordination of all of the required inspections and approvals. Plus a few extra items on the exterior which included, grading & leveling of the backyard, laying sod, installing a French drain along 2 sides of the house, plus adding a privacy fence to enclose the backyard as well as a driveway gate. We knew it would be a challenge but we had no idea what it all entailed and I can guarantee you that we would have gone a different route if we even had a hint that with almost every one of the above listed items we would experience at least some issue. One of the deciding factors to break free though was after we experienced a situation with our cabinets during installation. The cabinets were already 7 ½ weeks behind scheduled delivery but once they arrived we noticed the doors and drawers weren’t what we ordered. Calls were made to our GC as well as the cabinet-maker to find out the reason for the mix up. GC’s response – he did his best to try to convince us that the doors & drawers delivered were what we ordered and to replace them it would cost us even more money. One problem, we had in our possession a sample of the doors we originally ordered with our GC’s handwriting on the back confirming that this sample was the style of doors which we would receive. Despite this fact our GC didn’t give up trying to convince us otherwise; he would change his story, yell, tried to put J and me against one another, scream louder and shifted the blame to everybody else. Enough!! A few days later he was released and while we had to hire another cabinet-maker to give us the style of doors we originally ordered, we eventually achieved the look of what was originally envisioned for our kitchen. Finding, qualifying and selecting the needed subs & vendors, the coordination and logistics of lining everyone up, plus the selection of finishes and decisions which had yet to be made or had to be made once again was more time-consuming and frustrating than what we anticipated. But at times it was just the simple decisions such as which comes first, staining & finishing the hardwood floor or painting the interior walls, that tested our patience and will. The stress, frustration, disappointment and sacrifices which we experienced on so many levels is beyond anything I ever want to experience again, but somehow we did it. Sure a never-ending punch-list still exists and I now know way more than I originally ever wanted to know about the whole building process but somewhere along the way I also gained an appreciation and somewhat of a love and/or passion for it all. I guess it all goes back to what’s listed above under the first part of #1, all that we went through should’ve been enough to turn anyone off, but as each obstacle was somehow overcome a crazy affection started to grow. Of course the coordination involved with the whole moving process and the purchasing of needed furnishings and window treatments did nothing for this admiration, nor did the fact that we were basically kicked out of the house we were renting during construction because the landlord found a higher paying tenant which resulted in us having to spend several nights in a hotel until our house was “livable”, but somehow this “love or desire” developed and has left me thinking. While I don’t believe that all of the negative experiences that we encounter during our lifetime are predetermined, I do believe that it is our responsibility to use those experiences to somehow help others going through something similar. So that’s my struggle, how best can I help others in similar situations or maybe it’s what can I do to educate and prevent this from happening to someone else? Not sure about the answer yet, maybe it’s this blog (although I doubt it) or maybe it’s just to assist a friend when they’re faced with a similar situation…just not sure but it’s a thought that is constantly in my mind. So that’s my “brief” summary and explanation as to where I’ve been over the last several months. It took 18 long months to finally complete it and along the way we tried our best to find or create fun and memorable moments for us and the boys which at times seemed impossible but…We Made It!! We met some wonderful subs during this whole ordeal but we honestly couldn’t have done it without our Angel(who I’ll talk about in more detail in a future post). I’m not sure what the future will hold but I do know that despite all that we’ve experienced I feel extremely grateful & appreciative and hope that one day I can somehow return the favor and find a way to assist, or prevent, someone else from going through something similar. Tags: American Idol, atlanta, DIY, GC, general contractor, HGTV, Home, Home improvement, morningside, Phillip Phillips, remodeling, Renovation, renovation nighmare | Permalink. 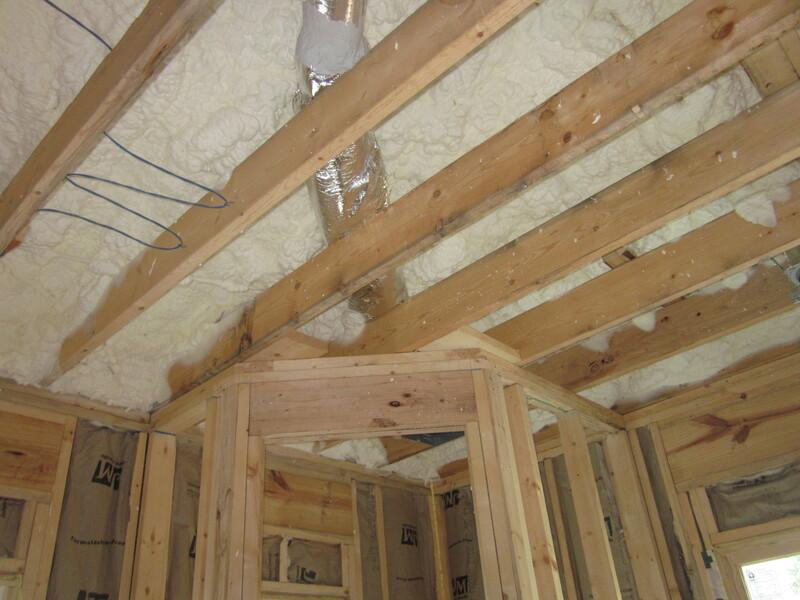 Several weeks back I had a post on insulation which was basically just me thinking out loud, or finding a way to justify the expense, as we tried to decide on whether to go with spray foam , cellulose, or rolled. 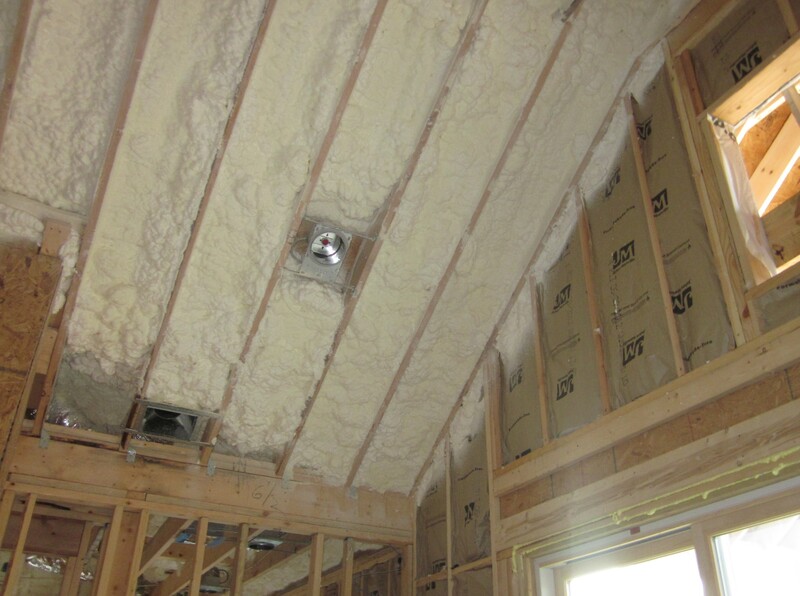 As mentioned in the prior post, I undoubtedly have a pretty big affection for spray foam and all of its benefits. I’m usually not one to buy into a product’s media hype but I bit, chewed and swallowed this stuff and the shows on DIY & HGTV have done nothing to help. But the cost, the cost is crazy high when compared to other options so what is one to do? So after a ton of further research and consciously trying to remain armed with an unbiased opinion I decided to get quotes from several different insulation companies. Part of my thinking was, If I can’t reasonably accept the fact that this stuff is too expensive then maybe having it repeated to me 5-7 times by complete strangers will to it. Plus, if I’m lucky maybe I’ll be able to tap into their knowledge a little and come up with a solution, they are the experts. From each of them I asked for a quote on spraying the entire house as well as their opinion on whether to use open or closed cell. I also requested a quote for their most economical as well as cost-effective solution and last I asked for a quote on a hybrid solution which would require some creativity. I limited the companies to only those that had great reviews or that were referred to me by others but as I found out the difference in experience and knowledge was vast. It also became quickly apparent that quite a few of the companies invested a substantial amount more money into training their representatives “how to sell and use all of the right jargon and lingo as well as the various tax incentives” versus educating them on the actual product – product knowledge. Unfortunately and regardless of pricing this eliminated a few of the companies pretty quickly, I’ve read too much about how improper installation of spray foam is potentially the blame for a lot of the negativity associated with it and if the guy selling it is clueless then I simply don’t have confidence in the applicators. In the end it came down to two companies, both great & highly referred and their pricing was very competitive however we ended up going with Spray Foam Services. Their representative, John Hartsfield not only knew his product but it was his creativity that sold us. Basically after thoroughly evaluating our house, not the simple walk in the door and look around, John came up with a hybrid approach that seemed to make the most sense and also helped to lower the expense. We ended up using open cell on the entire interior of the roofline, batts in the walls as well as in the ceiling of the new basement and in a couple of weeks he’ll be back to finish spraying closed cell spray foam on the exterior walls of the original basement. 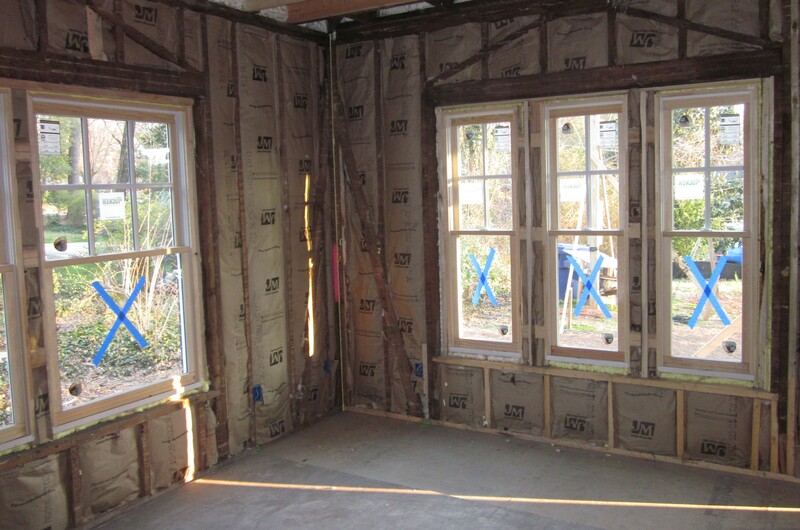 And yes, the end cost was slightly higher than a more economical approach of using cellulose in the attic and batts in the floor & walls but…well, we’ve been able to save a little money in other areas and I’m “hoping” (gambling) that in the long run we’ve made a wise decision – time will tell. I’ve really tried to stay away from needlessly promoting all of the various subs and vendors along the way, however I have no problem doing so when someone exceeds our expectations. John’s crew showed up on a Saturday morning and worked until after dark spraying the roofline, putting up the batts as well as sealing all of the doors & windows and then came back Monday morning to finish it up. Cleanup? Never would have known they were there, spotless. Seriously, these guys knew what they were doing and went about it in a professional manner which somewhat helped to justify the added expense of the spray foam. 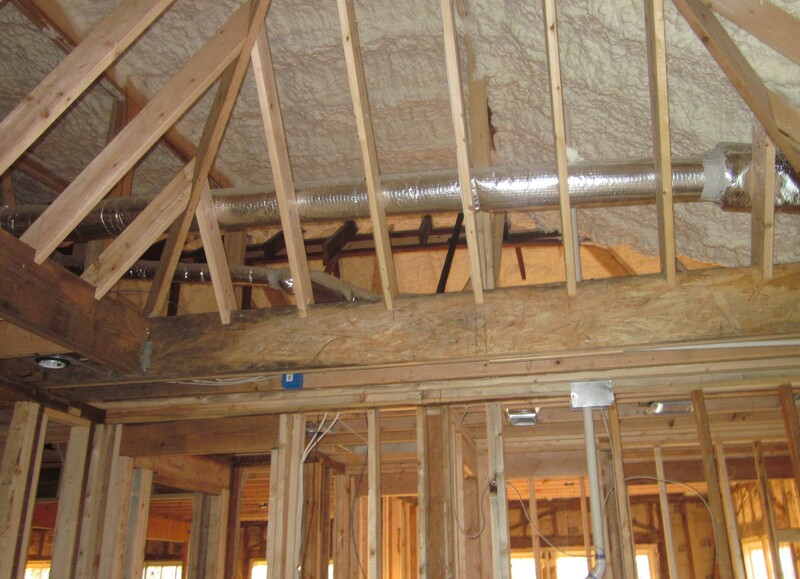 Tags: atlanta, attic, basement, DIY, HGTV, Home improvement, insulation, remodeling, Renovation, roof, Spray foam | Permalink. So I’m pretty pumped to tell you about what I received over the weekend. When we bought the house and started this renovation process over 16 months ago there was an old, heavy and very filthy sink in the basement that obviously was originally installed when the house was built back in 1927. Almost everybody along the way said to throw it out; both GC’s, wife, you name it but I just couldn’t. 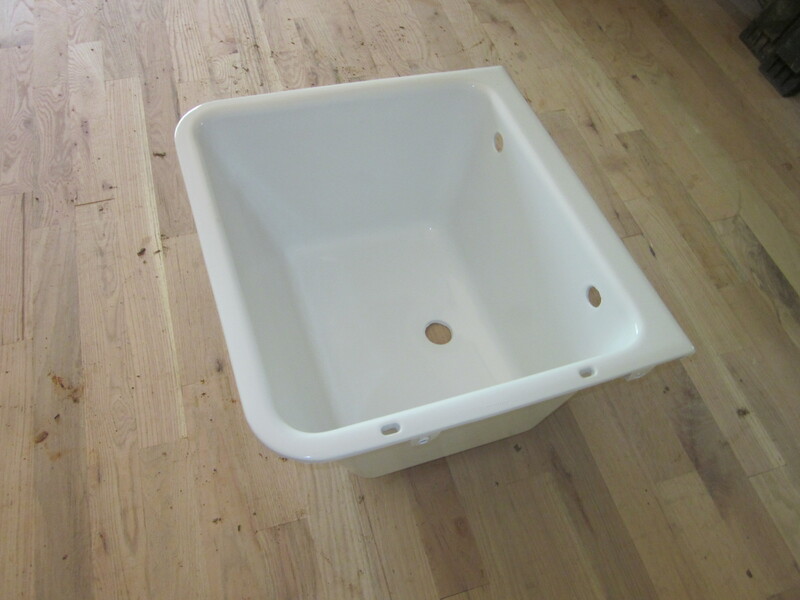 And so once it was detached from the floor it was moved to a far corner of the basement where it sat while I was asked no less than 20 times about what I was planning on doing with this old neglected sink – actually it was mostly referred to as junk. Well I didn’t know but I felt I would eventually find a home for it, something under all of that filth made it too cool to throw away. 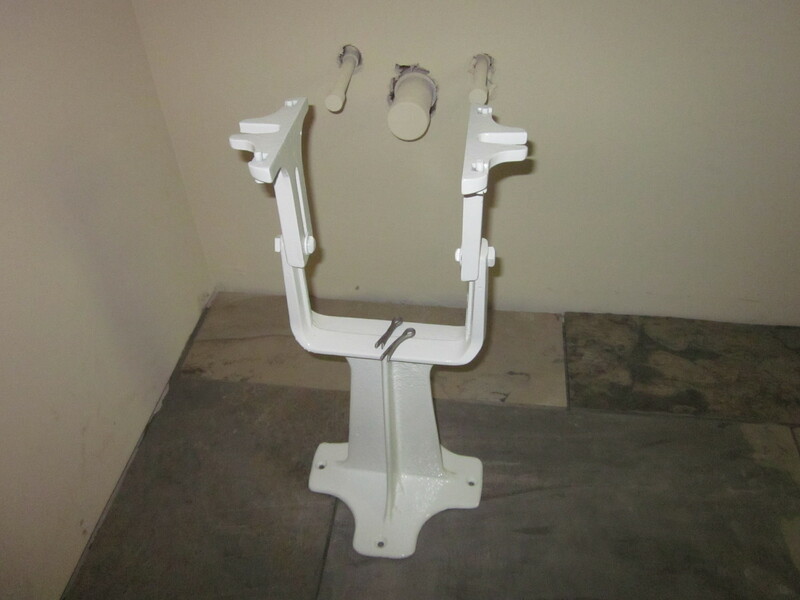 Well as we were trying to decide on the layout for our laundry room and the placement of a sink it came to me – what a perfect place for this nasty ole sink. But first I had to convince my wife that it would look good which I knew wouldn’t be easy in its present state. 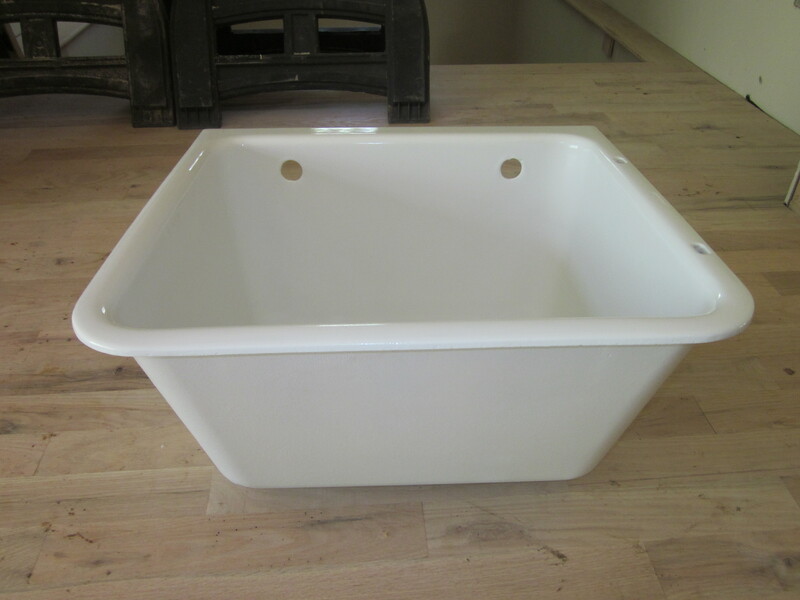 Now under all of the grime, rust, dirt, funk, etc…was a cast iron utility/laundry sink with a porcelain overlay but I had no idea how to even begin to clean this thing and being that it was pretty heavy it wasn’t as if I could easily move it or even put it in my trunk to take somewhere. 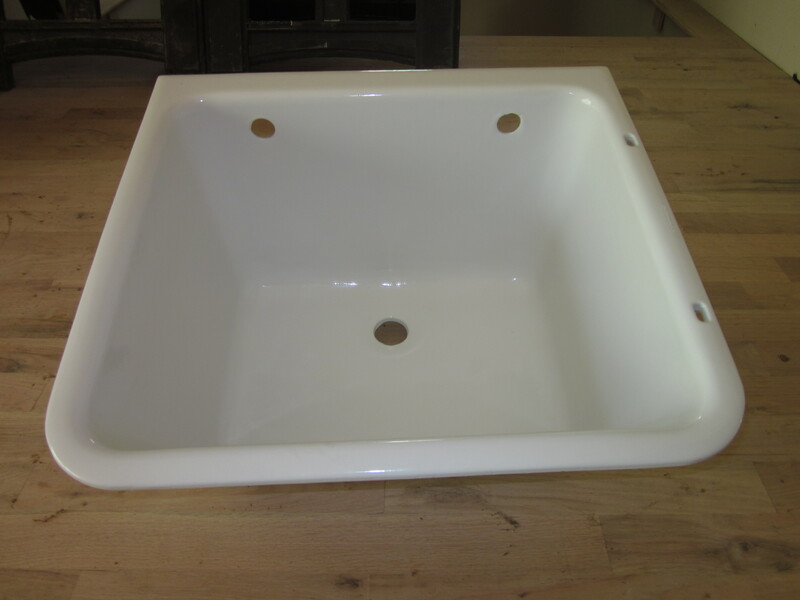 Well fortunately I was referred to a company in Atlanta, Quality Resurfacing, that restores and resurfaces old tubs and sinks so I decided to give them a call. The owner, Archer, came to pick it up that day and this past Saturday he called to tell me it was ready. I couldn’t wait, but at the same time I was a little nervous. My wife trusted me that the “finished product” would look good and it didn’t help that when the subject was brought up over the last few days, as my sink was getting prettied up, that I was potentially only digging my hole deeper by saying “trust me, it will look great, I know you’re going to love it”. So the moment arrives, Archer (owner) pulls up, I walk to his van to see the results and I was shocked. Gorgeous, looks brand new and the uniqueness of it makes it even cooler. But as we’re carrying it inside the true test awaits, wife’s approval. Loved it!! She now thinks it was one of our best decorating decision yet. So happy that we both had that foresight so many months ago. 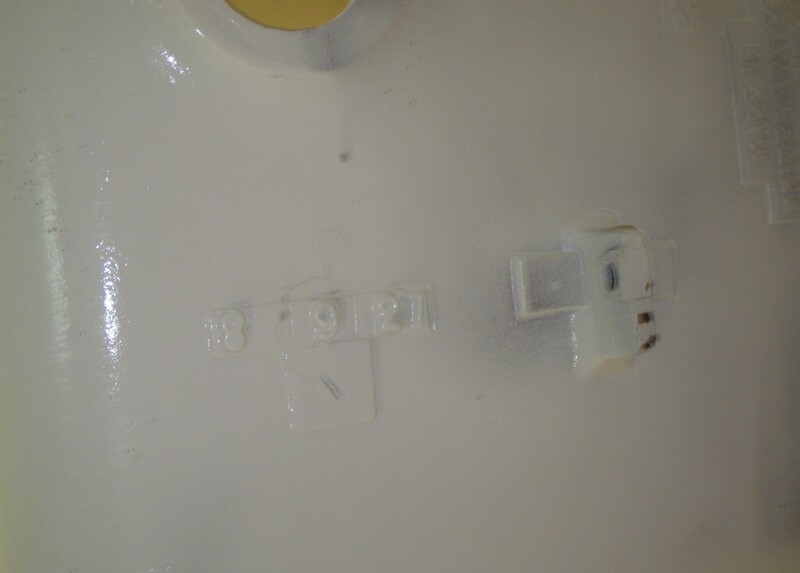 A few things to note; while cleaning it Archer was able to uncover the manufacturing date – August 9, 1927, also he was somehow able to clean up the original pins which now look brand new. Never thought a laundry room sink would get me so excited. Tags: atlanta, basement, Cast iron, Home improvement, kitchen, Laundry room, mudroom, remodeling, Renovation, Sink | Permalink. At the beginning of this “quest” our goals during the restoration process were to utilize as much of the original structure and its components as possible, but life and unfortunate events happen and as you know we’ve had to change course more than once. 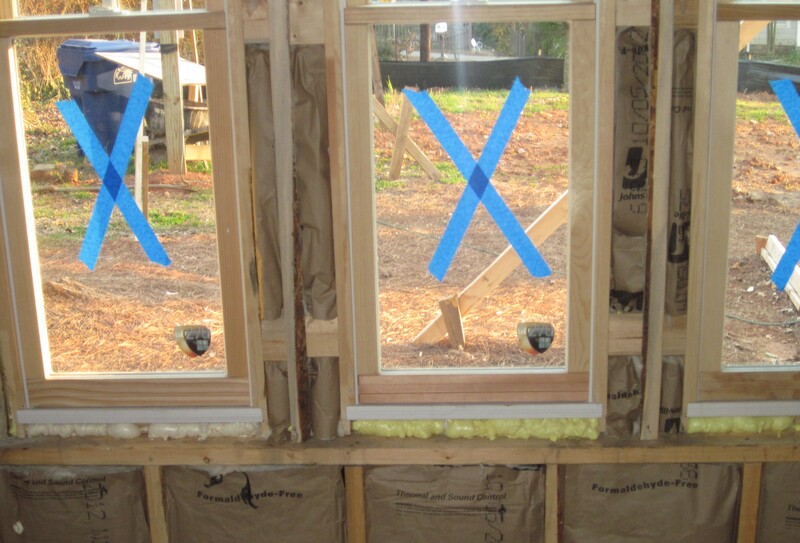 However, even from the beginning we knew that because of age, weather and neglect that we would need to replace the majority of our windows as well as their jambs. While not cheap we knew it was a necessity, even if for me it seemed hard to justify. I guess it all stems from the question of “how often do we really USE windows”? Don’t get me wrong, I love natural light; in fact I would love it if three sides of our house were glass but we rarely utilize them the way they were originally intended. Sure, there will be nights when we’ll sleep with certain select windows open but being that we live pretty much in the heart of Atlanta the vast majority of the time they will remain closed – and locked. So we researched. I now know more about U-Factors, SHGC numbers, Low-E Coatings, double and triple glazing as well as the benefits of the panes being gas-filled than I ever cared to know. But of course there’s more, types of windows; wood, fiberglass or vinyl framed along with the style; awning, casement and hopper. And to only add to the confusion the benefits of some of the above mentioned factors vary by region. So armed with all of this “knowledge” we set out for bids. We looked at and heard all of the various advantages and benefits that the various manufacturers tout, however at the end of the process we went with a more local company. The components were comparable to the more major manufacturers and fell within the recommendations for our region as well as their individual placement in our house, however what mostly sold us was the cost difference. I’ve bragged about him before but somehow, and without sacrificing quality, our GC, along with the window manufacturer, was able to reduce the cost by 32% over the original estimate. Of course any time you can save money during construction it’s a win, but for us this savings is beyond significant. I’m not sure how they were able to do it but that 32 % savings is much needed in helping us make up lost ground/money – thanks guys! The manufacturer is Tucker Door and Trim in Tucker, GA. In case you were wondering they’re double hung, wood framed windows, they have a U-Factor of 0.30, SHGC of 0.24, Low E Coating (0.037,S2), double glazed, Argon filled and NFRC Certified. 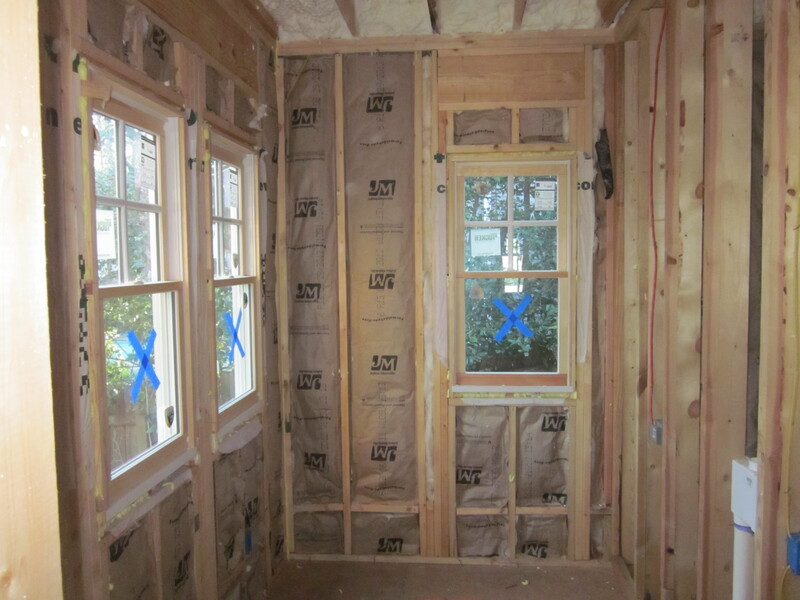 Tags: atlanta, Door jamb, Doors, Doors and Windows, Home improvement, morningside, R-value (insulation), remodeling, Renovation, Replace windows, Window | Permalink. Time certainly moves quickly and unfortunately I had to set some things aside but I’m back and over the next several days I’ll try to give an update on where we are in the renovation process. We’re still moving forward and even though the weather hasn’t been overly cooperative, and we’ve been constantly reminded that others move at their own pace no matter how much you try to prod them along, progress is being made. As mentioned, I’ll post updates on what we chose for insulation, installation of windows, outdoor room decision, drywall installation, exterior paint decision and where we are with the kitchen countertop decision. Six months ago I never envisioned that we would actually be this far along. While I had every desire and intention to turn this house into our home there is no way that if back then I somehow had been able to step aside and remove my tunnel-vision goggles I would have bet even a dollar that this dream might actually be achieved. Of course it would probably be somewhat rewarding to feel as if I had singlehandedly brought us to this point but it’s been quite the opposite and has taken a total team effort on numerous fronts. But even with this team effort we’ve also, and thankfully, encountered a few angels along the way that have provided us with invaluable guidance and assistance. My hope is that I’ll be able to provide an adequate account, acknowledgement and thanks through the next several posts, but realistically I can’t imagine how that will be possible. 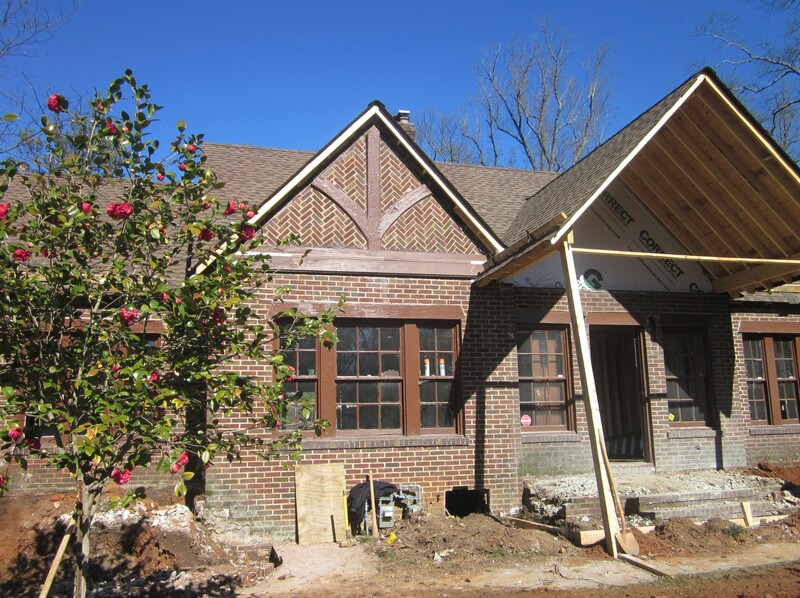 Tags: atlanta, Construction, DIY, HGTV, Home improvement, marble countertop, morningside, remodeling, Renovation, residential | Permalink. If you’re somewhat familiar with our story and if you read any of my posts over the last few months you know that if we’re to complete our house we’re going to have to get creative and find ways to reduce some of the construction expenses. When we were re-interviewing Contractors for our second go at this project a lot of them talked about how they were good at value engineering projects and how they would “probably” be able to find ways throughout the course of construction to lower some of our costs while not sacrificing our finished goal or the quality of it. I’m sure some of them would’ve been able to do so but one of the reasons why we chose our current GC is because he actually provided us with true examples on the front-end of how he would be able to do it and deliver to us our dream. From the bids we received he wasn’t the lowest in price nor was he able to get his bid as low as we were hoping but he assured us that he would continue to look for avenues where we could save money. I was skeptical at first for a few reasons; the contract with our current GC is a true Cost Plus contract. Meaning, we pay our contractor for the actual cost of the material and labor plus a predetermined percentage of those costs which basically is his profit. My feeling was that because of this arrangement he had very little incentive to reduce any of the expenses because that would in turn lower his profit. My second concern was just the simple fact that he was walking into a project that had challenges. The house was built in 1927, so who knows what issues he might find when he starts getting into the original structure. Plus, directly because of the “improvements” by our former GC our house now had structural issues. AND we’d been told by all of the contractors we interviewed (I believe 11 total) as well as our structural engineer that if we didn’t want to compromise the quality of our home or somewhat drastically change our overall plan of the house, then directly because of these past “improvements” there would need to be adjustments made to our framing and roofing plan which would significantly increase the overall costs. So my concerns seemed realistic, not only why would he look for options to lower the costs which would reduce his profit but how would he even be able to do so? 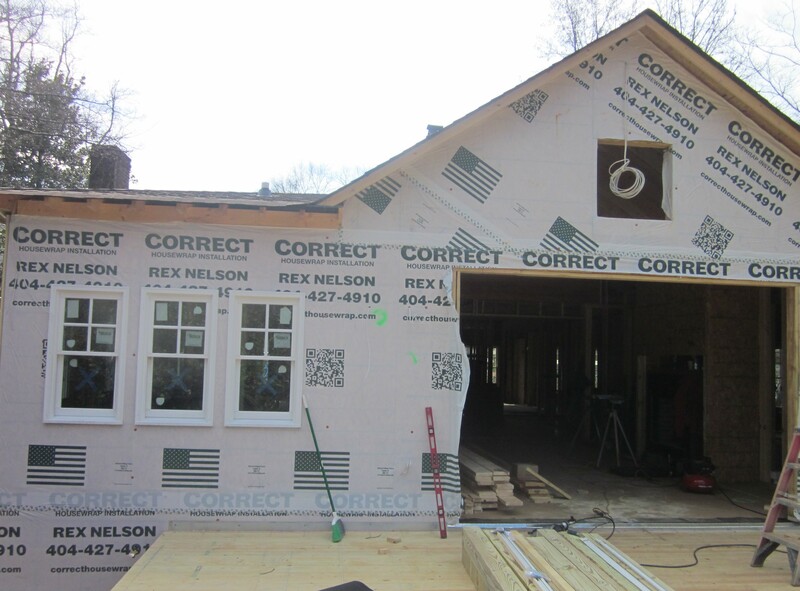 As stated above, we knew that going forward there would be extra costs associated with the construction, framing, roofing, etc…and we made certain that the quality of our current GC’s work was above par and that he wasn’t one to cut-corners – quality GC, sterling reputation, past clients give him nothing but praise – still just doesn’t seem possible. Well our house is far from complete and fortunately our GC has been true to his word. At the onset of our project he took it upon himself to have our roofing plan redrawn. Our original roofing plan had more peaks and valleys than the Himalayas. The amount of lumber required was enough for a house twice the square footage. By redrawing our roofing plan, while making sure that it didn’t change the street appearance of our house, or that seen by the neighbors, he was able to simplify it thus reducing the cost of lumber, shingles, labor, etc… At the same time he was able to find us a comparable shingle as to what had originally been spec’d which also helped to reduced some of the costs. We still have a lot more ground to makeup but overall this attributed to a 23.6% REDUCTION in what was budgeted for roofing. Of course I wish that would become a trend and we could reduce all of the expenses by 24% however I’m just grateful that he not only took the time to explore various options but even more so that he actually did it and lived up to his word. Amazing guy, so thankful we found him. A few pictures below of the shingles. Try to ignore the exterior of the house, the trim will be added shortly, as well as replacement of all of the windows and they’re waiting until the interior improvements are complete before they paint the bricks. One piece of advice, I would strongly recommend that before the shingles are installed that you inspect a few of them just to make sure they’re the same color as to what you’re expecting. While we confirmed that what was written on each of the packages was the same as what was ordered, we personally neglected to actually view the shingles and when we saw them on the roof we were somewhat disappointed as they seemed a little lighter in color than what we saw on the shingle board, as well as what we viewed online. 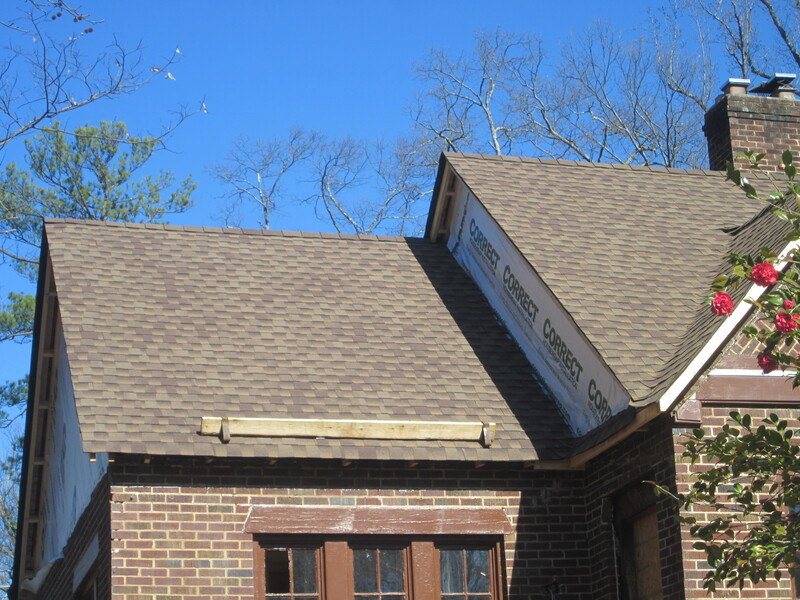 (GAF also recommends the above on their website) They all came from the same batch however they’re definitely lighter, my hope is that once the trim is added and the brick is painted that less of the redness in the shingles will be highlighted and the brown will become more dominant. Going one-step further, it would be even better if one was to use the same approach in selecting a shingle color as what is recommended when painting an interior wall. If possible take a few shingles of various colors and have them placed on your actual roof so you can get a better idea as to what you’re getting and how the sun might alter the look/color. Sample boards aren’t always accurate and I’ve been told that not everything you read or see on the internet is completely accurate as well. 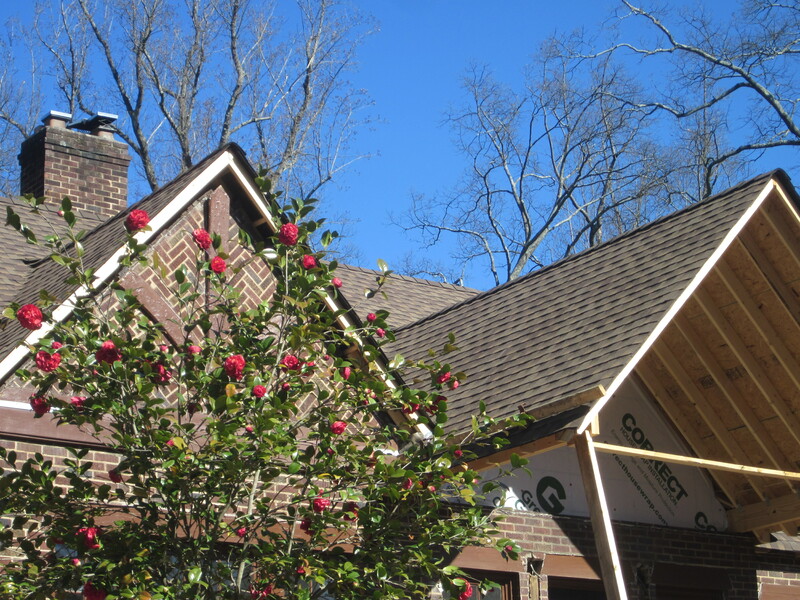 Tags: atlanta, contractor, DIY, GAF, GAF Materials Corporation, general contractor, Home improvement, new roof, Renovation, replace roof, residential, roof, shingles | Permalink.